In January this year, Tullow announced that it had agreed to farm-down 21.57 percent of its 33.33 percent interests in Exploration Areas 1, 1A, 2 and 3A in Uganda to Total E&P Uganda B.V for a total consideration of $900million. However, the move was opposed by CNOOC Uganda Limited - another joint venture partner. "Tullow's farm-down in Uganda continues to progress with the signature of the pre-emption documents by the Joint Venture Partners. The Joint Venture Partners have officially notified the Government of Uganda, seeking its approval of the transaction. Tullow now anticipates that the farm-down with Total and CNOOC will be complete in the first half of next year with cash payment on completion and payment of deferred consideration for the pre-completion period being received in 2018," the trading statement dated 8th November this year, reads. Total and CNOOC have locked horns on the farm-down with Total seeking to purchase Tullow's interest alone. 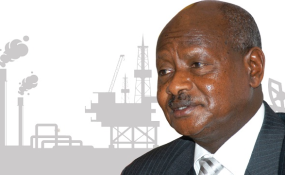 The impasse has prompted President Yoweri Museveni to intervene holding talks with both companies on the issue. Before, CNOOC had exercised its preemption rights, Total was likely to consolidate its position as majority shareholder with 54.9 percent stake in Uganda's oil resources. In the statement, Tullow expects completion of the farm down before the end of June next year. The company is currently working towards Final Investment Decision (FID), in the first half of 2018, with Front End Engineering Design (FEED) and Environmental and Social Impact Assessment (ESIAs) for upstream and pipeline progressing in line with schedule. The statement also indicates that the joint venture partners are working towards reaching Final Investment Decision (FID) in the first half of 2018 at which point Tullow's second cash installment from the farm down will be received. Pre-emption rights means that in case any of the joint venture partners decides to sell its assets or interests in the petroleum sector in Uganda, the other partners have the 'first' priority to purchase the assets before a third party can be allowed to do so. However, a joint venture partner can waive its right. Once the farm down is concluded both CNOOC and Total E&P Uganda BV will each have 44.11 percent stake in Uganda's oil so far discovered oil reserves. According to Tullow, operational activities are continuing as planned. For instance, the company together with joint venture partners is engaged in Front End Engineering Design (FEED) particularly for the Bulisa project as well as Environmental and Social Impact Assessment (ESIAs) for both the Bulisa project and the crude oil pipeline.